Tenuta degli Ultimi – autumn in the Veneto. “For once you aren’t arriving in the wrong season!” Sebastiano has been encouraging me to visit Conegliano away from the heart of bitter winter for years. “A proper tour of the area is now possible.” Harvest is over but only just, foliage and the occasional grape is still on the vine. His homeland is sunny and breezy. I arrived at sunset. By the time we reach Al Castelletto for dinner it is decidedly chilly. From my perspective necessarily cold, because we’re about to get run over by a cavalcade of traditional workingman’s country fare. I’ll be sweating by the end of it, no matter how icy the room. This is a meal of retribution, for every eastern NC barbecue dinner I’ve inflicted upon unsuspecting visiting Italians. Chicken in a spicy yogurt sauce comes out first, along with some fried ham dumplings, a mixed greens salad (rare as a unicorn sighting in my travels in Italy) beef carpaccio, fritto misto with chicken nuggets instead of frutti di mare, baccala, polenta squares, turkey in gravy of all things, straight-up meatballs, more. It blurs. Next thing I know it is midnight and I’m drinking a brown distillate at the hotel bar, for purely medicinal reasons. It needs to burn through. At sunrise I go for a run, through a cloud of school children heading for the large, columned Academia, through the centuries-old stone center of Conegliano, eventually up some frighteningly steep roads to the castle above it all, a lung-busting ordeal that does yield beautiful panoramas of the town and undulating hills that retreat to Dolomites on the horizon. The fortress above Conegliano looks particularly medieval: high stone walls, a chess-piece tower flying the Italian flag. The sun is rising across a circular cobblestone piazza lined by lollipop Seuss cypresses. It gives an austere white Romanesque church aura, luminescence. The roads that circle the hilltop are steep and stony and windy enough that I slow to a trot and then a gingerly walk on my descent. Falling would alter my itinerary to include a tour of emergency rooms of the Veneto, an unappealing prospect. After barely half an hour I limp through covered arched walkways back to the painted faux-Michaelangelo façade of my hotel, cherubs, clouds, lutes, salvation from the cross. I’m exhausted, and ready to see Sebastiano’s vineyards from the comfort of a 4x4’s passenger seat. And there is more climbing to do. The Conegliano-Valdobiaddene DOCG is a vertically inspiring place, conical hills lined like topographic maps by vines broken only by the occasional remote farmhouse, buildings that seem like hermitages in their inaccessibility and isolation. It’s dark under the shadow of these slopes, in rich green pathways lined by mossy stone walls improbably holding back so much earth. The vines haven’t started to yellow. The narrow gravel road is crowded by shoots and tendrils, invertebrate arms clawing at our windows. I use the wooden posts of trellises to steady short excursions into the verdant valleys of vines. You could get lost here in a highly manicured, overwhelming-to-the-senses collaboration of humanity and nature. This is impressive agriculture. We stop at the church where Sebastiano wishes to be married (I believe the bride is as-yet unselected.) Its clock face is huge! Oversized I suppose, but probably necessary to be visible from settlements at the base of the hill. I peer through a vent and see a white marble alter and mahogany cross illuminated by sunlight. Rich reds and blues give the quite violent oil paintings contrast from the rather ascetic white stone walls and grey vaulting. Sunlight makes hilltop quite warm. I’m getting thirsty! Luckily, Sebastiano knows a little place nearby where we can grab a snack. Osteria Senze Oste is a regional oddity, a self-serve, honor system “café” on a hillside surrounded by vineyards. Several large vending machines dispense Prosecco and more, if you want coffee or bread or salami or cheese you simply take it, and leave money in the cash box. I buy a crostata made with Raboso grapes, a loaf of white bread to support my growing collection of local cheeses, and a bottle of water. A collection of tired-looking cyclists were enjoying an early lunch when we arrived. From the look of them I’m glad we drove! 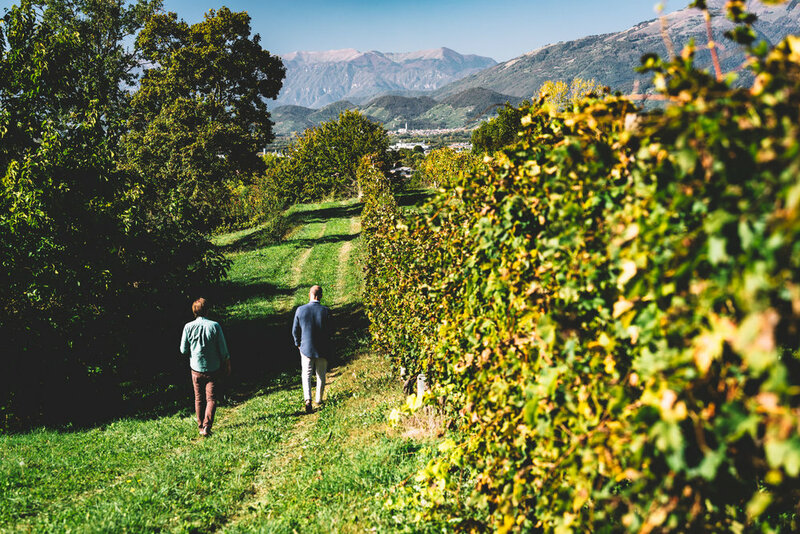 Several scarecrows in fine autumn attire loom above the steep hills and dizzying switchbacks of Conegliano-Valdobiaddene that swirl around us. These slopes aren’t scenery casual wine fans associate with Prosecco, and maybe for good reason. On the car ride back to reality Sebastiano says that any producer in this area making less than half a million bottles of bubbly is considered small. The big wineries (Mionetto, etc) pump out millions of cases. It’s hardly an argument for terroir. Near the village of Collalto we meet the dog of Sebastiano’s brother, a friendly Australian shepherd charged with patrolling the fence line of the family’s large, gently sloping vineyard of Glera, Verdiso, and Bianchetta grapevines. It’s a quiet place bordered by a centuries-old farmhouse and barn. The dog seems happy to have company. I’m happy to discover that an inattentive harvester missed a significant amount of mild, ripe Glera grapes. I pick several sticky handfuls to snack on during our amble around the property. On this warm day at the edge of autumn it’s easy to feel why this is a favored site. I lose my coat and roll up my sleeves. Across the sunlit valley stands an ancient tower. Sebastiano ruminates on the constancy of the view, how ancestors would have looked across the landscape and seen the same fortification cleaving the horizon. We stop by Sebastiano’s house, to borrow a cheese knife (for the road.) By the end of the day I’ll be on the Slovenian border. It remains to be seen if my appetite will ever return. At dusk I’ll be watching container ships making waves in the Adriatic. And eating cheese! New dogs, new vineyards, same fuel to keep this journey going. Bikiniblick and the devil's pitchfork. Anglo-Italian deference. Contemporary Pizza at i Tigli.